Late last year we interviewed John Harder, research and development manager for RIO Products. We wanted answers to some nagging questions about leader and tippet materials, and John provided us with some detailed and revealing answers. MC: Can you offer a brief explanation of how monofilament, copolymer and fluorocarbon materials differ? JH: Monofilament is a single strand of any synthetic material whether it be nylon, fluorocarbon or polyester. However, the term monofilament as related to fishing has become synonymous with nylon. A copolymer is a blend of 2 or more plastic materials such as nylon 6 and nylon 12 or nylon and polypropylene. Flourocarbon differs from nylon in several ways. Flourocarbon is not effected by UV light and does not absorb water, which weakens nylon. Fluorocarbon sinks faster than nylon because the specific gravity of fluorocarbon is higher than nylon. Lastly, the reason most anglers purchase fluorocarbon rather than nylon is fluorocarbon has a lower index of refraction and is less visible than nylon underwater. MC: There always seems to be confusion among anglers about what constitutes “stiff” or “supple” nylon. How do you measure stiffness or suppleness and why does it matter in leader materials? Is it simply a matter of diameter? JH: The stiffness/suppleness of leader material is not just simply a matter of diameter. Yes, the stiffness/suppleness is a function of the diameter for a specific nylon formulation. However, nylon formulations are not all alike. The nylon stiffness/suppleness can be changed by altering the nylon formulation. In the case of trout fishing, the fly will drift more naturally in the current with a supple material. On the other hand, in saltwater a stiffer nylon is more abrasion resistant and turns the fly over better in the wind than a supple nylon. The stiffness/suppleness of nylon is determined in the lab by very accurately measuring the amount of force that is required to bend the nylon a specific distance. MC: RIO, beginning with Jim Vincent, became a major influencer in making sure of quality control in leader manufacturing. What kind of controls does RIO have in place now, and are they any different than they were 30 years ago? 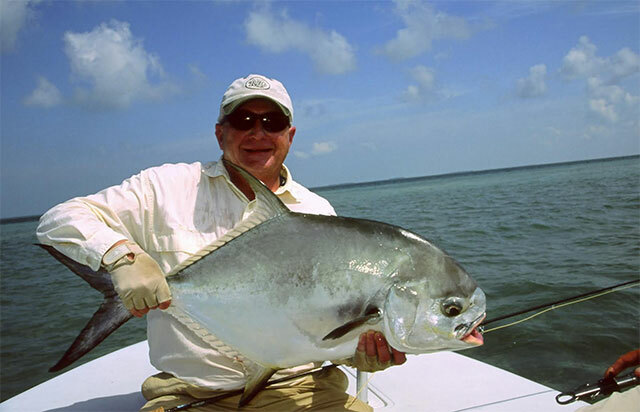 JH: Jim is a very experienced and knowledgeable fly angler who demands that products perform as expected. As a result of Jim’s stringent quality control standards for manufacturing, RIO leaders and tippet, set the quality standards for the future manufacturing of leaders and tippet. I can honestly say as a result of advances in modern technology, materials and design, the quality and performance of RIO leaders and tippet are superior to leaders and tippet made 30 years ago or even 5 years ago. MC: Are all modern prepackaged leaders the same “out of the box,” or is there some preparation or conditioning you should do to them before beginning to fish? JH: All modern leaders are pretty much the same “out of the box” other than the taper designs and nylon formulations will vary from manufacturer to manufacturer. The only conditioning modern leaders require “out of the box” is the leaders must be straightened to remove the curls. The curls can be removed by simply stretching the leader between your hands 2 or 3 times. I do not recommend taking the curls out of the leader by pulling the leader through a leather or rubber pad. Pulling the leader through a pad can generate sufficient heat that can damage and reduce the strength of the leader. MC: I’ve always felt the best knots are first and foremost the ones you can tie the easiest and most confidently. Certain materials are easier to tie knots with, I’m assuming because they are more supple and have slicker surfaces. Is there ever a reason to use a material that has lower “knotability” because of other advantages? JH: The knots you can tie the easiest and most confidently is a good approach to take when tying knots, assuming the knot is an appropriate knot for the application and has high knot strength. The most important factor when tying knots is the knot is tied correctly and lubricated when tightening the knot. There is no question that certain materials are easier to knot than others. The ease of tying knots is a function of several parameters such as the material formulation. Materials that are supple are typically easier to knot that stiff materials. However, additives can be mixed into the material formulation to make the material, even a stiff material, easier to knot. Coatings can also be applied to the surface of the material during the manufacturing process that will make the material easier to knot. Some material formulations, even if additives are mixed into the formulation or a coating is applied to the surface, will be difficult to knot. There a very few instances where choosing a material that is not as easy to knot as another material because of other advantages. One instance I can think of is if you need a highly abrasion resistant material. Some highly abrasion resistant materials are very stiff and are difficult to knot. However, as a result of recent advances in material technology, RIO is developing a highly abrasion resistant material that is more supple and easier to knot. MC: How long does leader material last now, how often should it be replaced, and how can you tell if leader material is past its prime? Do you have to lose a fish to find out? JH: How long leader material lasts, and how often should it be replaced is a good question that is asked quite often. I have researched this question several times with the material manufactures and I am sorry to say I do not have a good quantitative answer for you. I have found lab test data but unfortunately lab test data does not relate to the fishing world. Because there is no quantitative data available that relates to the impact of heat and sun light on leader material by anglers, RIO is embarking on a testing program to determine the impact of heat and UV exposure on leader material by anglers. I can tell you Nylon is affected by heat and UV light whereas Fluorocarbon is affected by heat but, is not affected by UV light. I recommend you do not expose leader material to excessive heat for an extended period of time such as in the trunk of a car on a hot sunny day and not to expose leader material to direct sun light for an extended period of time. To be safe rather than sorry, I recommend replacing leader material annually, especially in sizes 3X and smaller. MC: The new Powerflex Plus material from RIO promises 20% more tensile strength for a given diameter. How does the new VHT Nylon technology affect elasticity and suppleness? Is it superior to fluorocarbon? JH: The tensile strength/diameter ration of the new RIO Powerflex Plus Tippet is 20% higher than the standard RIO Powerflex Tippet and more that 20% higher than other brands. The tensile strength of 5X Powerflex Plus is 6.0lb whereas the tensile strength of the standard Powerflex tippet is 5.0lb. Like many things, there is give and take of the physical properties of the material. Comparing the physical properties of the Powerflex Plus Tippet versus the standard Powerflex Tippet, as a result of the Powerflex Plus’s proprietary and highly confidential manufacturing process, the difference other than tensile strength are minimal. The Powerflex Plus Tippet is slightly stiffer and has slightly less elongation than the standard Powerflex tippet. Trying to compare nylon tippet material to fluorocarbon tippet material is like comparing apples and oranges. The major difference between nylon tippet and fluorocarbon tippet is that fluorocarbon is less visible underwater. 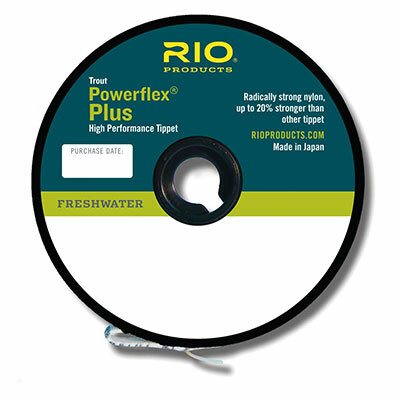 With the introduction of RIO Powerflex Plus, nylon tippet is now also stronger than a fluorocarbon tippet with the same diameter. MC: Do you think science will continue to provide increases in leader material performance? Or is there a natural limit to performance on what specific materials, like nylon, can provide? Any chance that some other material could enter the fly fishing lexicon in the future? JH: Based on the materials available today, namely nylon and fluorocarbon, and discussions with the major chemical companies, I do not foresee any new materials that exhibit the physical properties required for leader material in the near future. However, if you asked me the same question 2 years ago my answer would have been the same. Then a proprietary process for making nylon tippet stronger was developed by a major manufacturer in conjunction with RIO. Who knows what material may be developed tomorrow that exhibits all of the physical properties required to make high quality tippet material.